The October 12th chess column of the Chicago Tribune noted the arrival of Emanuel Lasker in New York on October 7th and also that he would be making a tour of this country under the management Walter Penn Shipley of Philadelphia, with a stop in Chicago very likely; Lasker had not made a visit to the city, except for a brief stop the previous year, since 1894. On November 3rd Lasker began eight day stay in Philadelphia taking part in simultaneous exhibitions, consultation games, and various off-hand games. SDN-005600, Chicago Daily News negatives collection, Chicago History Museum. "Local chess enthusiasts are looking forward to veritable chess carnival before the end of the month, as not only will the championship tournament be well under way, but Emanuel Lasker champion of the world will be in the city, besides simultaneous play and lectures will indulge in single handed contest with leading local players." The first of Lasker's simultaneous exhibitions in Chicago took place November 15th on the premises of the Chicago Chess and Checker Club, where the champion played twenty-three games of chess and two games of checkers simultaneously winning seventeen games of chess losing two and drawing four; as well as drawing in the two games of checkers. It is perhaps a bit ungenerous to think that Lasker was being the gentleman in order to give encouragement to Mrs. Lynn. Mrs. Frank Lynn would in a few years time would edit the chess column of the Tribune for a couple of months. In a previous post I asked the question was Mrs. Frank Lynn the earliest female editor of a chess column in a major metropolitan newspaper? I have since learned she was beaten to the laurel of earliest female editor by Rosa Jefferson who's column began to appear in Memphis Commercial Appeal in 1903, which she edited for nearly thirty years (as well as editing a music column). 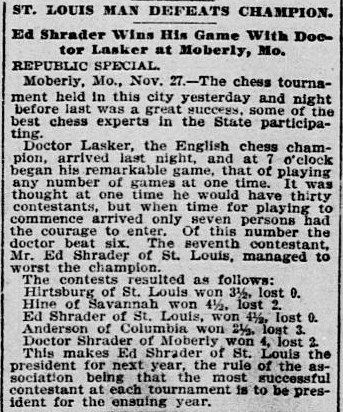 Sidney P. Johnston's chess column of November 23rd, Across the Chessboard in the Tribune, gave three more games from the Lasker's November 15th Chicago visit. Mr. Frank Lynn, husband of Mrs. Frank Lynn one of the losers against the champion. After leaving Chicago and resting for two days the champion gave a simultaneous exhibition in Milwaukee at the Deutsche Club on November 18th playing 23 games, drawing three ,winning the rest, then it was on to St. Louis from November 22nd to the 25th, his return engagement in Chicago was set for for November 28th and 29th. But there must have been delay of a few days for we have found the above news item in The St. Louis Republic of November 28, 1902. By December 10th the champion was back in the city, for he played a simultaneous exhibition at the University Club, playing fourteen games conceding the odds of a knight, winning thirteen, losing one game. On December 12th, Lasker gave his final simultaneous exhibition at the Chicago Chess and Checker Club, playing twenty-three games, the final score being twenty-one games won, one loss, and a draw. His only loss was again at the hands of Mrs. Lynn, the drawn game was against J.W. Taylor. At this point I have not found the score to Mrs.Lynn's second victory over the champion. It took Lasker just twenty-five minutes to win the following game. 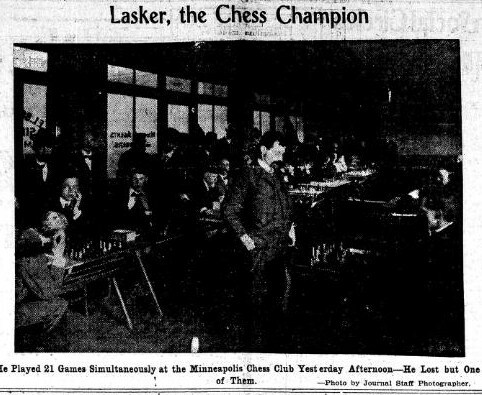 On January 22nd, Lasker gave a simultaneous exhibition of twenty-one games at the rooms of the Minneapolis Chess Club, it was his first visit to that city. He won seventeen, one loss, with three draws. "After the tournament Dr. Lasker was entertained at a banquet at the Commercial Club. In response to a toast, he gave a talk on the beauties of chess. So we leave the champion playing not chess, but a game of cards. Til now there has not been a generally available biography of Aron Nimzowitsch; there are course his own books, and a number of game collections; but nothing like a comprehensive biography. Nimzowitsch has always had a certain mystic quality attached to him . What the authors have done is to pierce the veil that has obscured the man. Nimzowitch's early years in Riga, his family life, and his wandering student years in Riga, Zurich, and Germany give us a sense a man pulled between familial duty and his intellectual pursuits; the family business or the life of a chess master. Almost from the very start of Nimzowitsch's chess career he was the center of controversy, for both his eccentric behavior and unorthodox ideas about chess. Nimzowitsch's first tournament was the 1904 Coburg Haupttunier A, "It was quite a challenge for a newcomer who had not even taken part in a local club tournament. But he had a strong belief in his own abilities and had been practicing hard in the cafes of Berlin." It may have been this strong belief in his own abilities that may have led many to think of Nimzowitsch as ill-mannered prat. Siegbert Tarrasch known as the "Praeceptor Germaniae" ( the Teacher of Germany) was one of the most influential chess writers of his time. To Nimzowitsch, Tarrasch was the great "popularizer" of chess but he considered him intellectual mediocrity. Tarrasch for his part who was also one of the most successful tournament players of his time, thought of Nimzowitsch's play as "perverted". The dispute at times became quite personal; with each sure of his ideas and each not willing to give any ground. 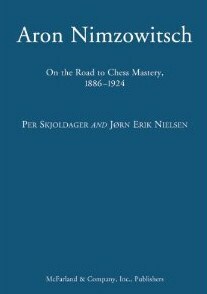 The dispute was carried out in the chess press in game notes and articles, many of which are reproduced in the book, of special interest are those games where both Nimzowitsch and Tarrasch notes to the same game are reproduced. In the end an uneasy peace was reached by these two giants of the chessboard. There are gaps in the chess career of Nimzowitsch, some of this may be explained by his dispute with Tarrasch, he didn't play that often in tournaments in Germany where he may have felt Tarrasch and his allies held sway. The first world war and the Russian civil war in its aftermath, limited Nimzowitsch's playing opportunities. There was also a period when his health became an issue, he is thought to have suffered from tuberculosis for a time. It was the conditions in post-war Riga that made it necessary that Nimzowitsch settle elsewhere at least for a time. There arose the opportunity to give a number of simultaneous exhibitions along lectures in Sweden then later in the rest of Scandinavia; it was these lectures in which Nimzowitsch was able consolidated the themes for his books; and over time Nimzowitsch made Scandinavia his home base of operations finally settling in Denmark. Would we have Nimzowitsch's books, if he didn't have had these interruptions in his career, had he been able to play more often in tournaments? The authors think not, and I tend to agree with them. For me the surprise of the book is the number of simultaneous exhibitions Nimzowitsch gave, I had never thought that he played that many simultaneous exhibitions in his career. Be warned this is no lionizing portrait , there are many anecdotes in the book most at Nimzowitsch expense. He did not suffer those who he viewed as fools lightly, in an era when being a gentleman still mattered; to Nimzowitsch with his outsider status as a Jewish Latvian of Russian citizenship and rebel nature it seemed not to matter to him. It is difficult sometimes to review a good book, in that you don't want to overpraise; to gloss over a book faults however minor. No such difficulty exists for this new Nimzowitsch biography, if anything one cannot praise this book enough. A second volume is promised for some time in the future for this reader it cannot come soon enough. If I could I would easily give it six stars out of five. Very well done and like Dickens' Oliver, I want more, please. Louis Uedemann served as chess editor of the Chicago Tribune off and on from January 1901 until his death November 22, 1912. Uedemann played in ten of the first eleven Western Chess Association Championship (predecessor of the U.S. Open) winning the First (1900) and Third (1902) played in Excelsior, Minn; tied for first with Max Judd and Sidney P. Johnston at the Forth (1903) Western Chess Association Championship in Chicago, but finishing third after playoff, with Judd being the winner. He placed second at the Fifth (1904) at St. Louis; placing fifth at the Sixth (1905) again played in Excelsior; placing fifth in the Seventh (1906) in Chicago; third at Eighth (1907) and forth at the Ninth (1908) third at the the Tenth (1909) all three held again in Excelsior, Minn. and finally third at the Eleventh (1910) held in Chicago. Uedemann placed second to Jackson Whipps Showalter at the Chicago tournament of 1890. Uedemann placed 7th out of 7 at the Third (1890)USA Chess Association tournament in St. Louis, Showalter again being the winner; he also placed 4-5th at the Forth (1891) USA Chess Association tournament in Lexington Ky., Showalter then again being the winner. Uedemann also played at the Seventh American Chess Congress (1904) finishing third in St. Louis, Frank Marshall this time being the winner. Uedemann was born in Searbeck, Westphilia, Germany on January 10, 1854. He came to the United States when he was 12 years old and settled in Chicago. Uedemann married Miss Alwine Lohmann of St. Louis on December 28, 1880, they had two daughters. Alwine Uedemann died at the age of 82 on April 22nd, 1940. Uedemann was a stalwart member of the Chicago Chess and Checker club and at the time of his death he was the secretary of the club, he was also several times the club champion as well champion of the Illinois State Association. Uedemann took part in a number of cable team matches as a member of the club. The Brooklyn Daily Eagle of November 27th, 1912 states "more than once he figured in team matches by telegraph with the Brooklyn Chess Club and was always recognised as a most dangerous opponent." Uedemann was also the inventor of a code for use in telegraphic matches. The following games are from an match the twenty five year old Uedemann played for the challenge cup of the Chicago Chess Association, which was lost by Uedemann to J.D. Adair, with the score being Adair 5; Uedemann, 3; drawn, 3. J.D. Adair was the President of the Chicago Chess Association which had been founded on a permanent basis on April 21, 1877, with Adair being named President and Uedemann named to the executive committee.